Dark Regions Press, 9781626410732, 92pp. 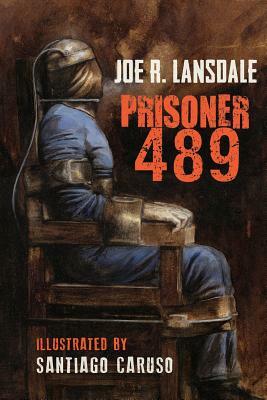 Bestselling author Joe R. Lansdale (Cold in July, Hap and Leonard series, Bubba Ho-Tep) makes a return to horror with the dark and intense new novella Prisoner 489 fully illustrated by world-renowned artist Santiago Caruso. On an island with a prison for the most evil and powerful criminals in the world, a new prisoner is strapped to the electric chair for execution. After multiple surges of electricity and nearly knocking out power to the entire island, the prisoner is finally dead. The staff buries him in the prison graveyard with a simple marker baring three numbers: 489. After the body is buried, a violent storm rocks the islands and a staff member goes missing. The crew rushes into the storm, searching for their lost comrade. They find that the burial site of prisoner 489 has been unearthed, and the body that was inside has gone missing. With a horrific finding and strange noises around them, a powerful threat is closing in. It's a threat that they thought was impossible, and it will force them into a battle for their lives.